One of the intial meaures that you should take is to keep the bag or container that the fish is transferred in sheltered from the light. If the fish is kept in the dark during the transfer, they will be blind to objects that are moving outside, which will greatly reduce the fish’s stress levels. You should try to get back to your aquarium location as soon as possible. You may notice that your fish has lost some of it’s color during the trip, which is a normal reaction to stress. Once your fish has become acclimated to it’s new environment, you will begin to see its color restored. When you arrive at your aquarium location, place the container which is holding your fish into your tank without opening it for at about 15 minutes. This will help your fish to acclimate to the temperature and surroundings of your tank before being unleashed. A common mistake made by aquarium owners as they introduce new fish into their tank is emptying the bag or container into their tank with the water from the store included. It is very important to avoid pouring the pet store water into your tank. You should meticulously open the container of your fish, and then introduce a similar amount of water from your aquarium into the container. You can then keep your fish container submerged in your tank for another fifteen minutes. Once the fifteen minute period has expired, you can then carefully remove the fish from the container using a fish net, and place it into your aquarium in a tender manner. Again, be certain that you do not pour any of the pet store water into your aquarium because this can easily introduce any previously existing diseases into your aquatic environment. 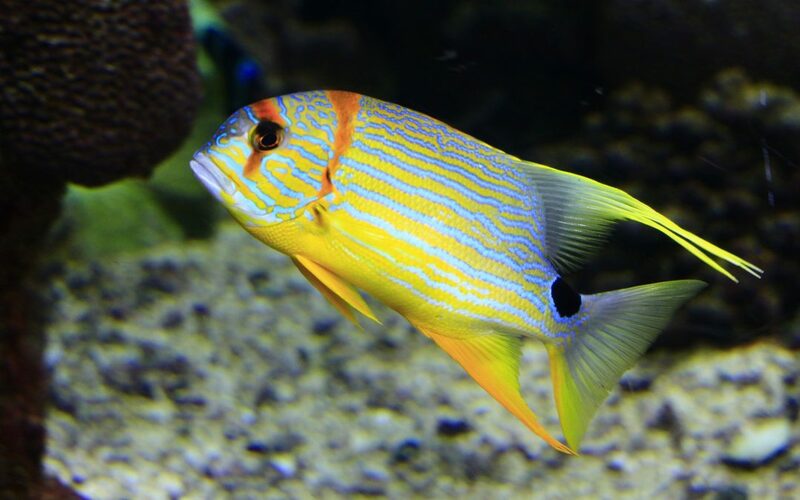 It is important to understand that your new aquarium will be a very unfamiliar environment for your new fish and a small change in water quality, as well as temperature and pH levels, can have a serious impact on the health of your fish. By following the simple steps discussed in this article, you will help to ensure that the transition for your fish from the pet store to your aquarium will be a successful one. If you have any questions regarding salt-water aquarium maintenance, you can contact the custom aquarium design professionals at Normal Aquatics at (203) 292-5922 for a no-cost consultation.